Firstly, what would you like to accomplish with your landscape design? After all, functionality is just as important as aesthetics. If you live somewhere that gets a lot of sun that makes being outside unbearable, consider prioritizing shading by planting trees with good foliage cover. If you have a family with growing kids, then filling your yard with too many plants and features will limit their play space. Perhaps a wide-open yard with a garden space that they can help in would be ideal. Think about what would benefit your household the most and ask your landscaper what may work best. Secondly, ask yourself how much you’ll be able to maintain the landscape. Some plants will require more attention than others, so if you’re not going to be able to regularly care for your yard, don’t expect more high-maintenance plants in a landscape design to survive. 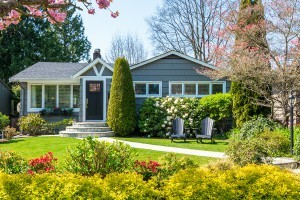 A professional will have a good idea of what is easier and harder to care for, so explain how much time and effort you’ll be able to put into your yard. Also, ask exactly what will need to be done once the plans have been made. Thirdly, keep a budget in mind. It’s easy to go overboard with what you would like to include but, thankfully, having an expert help with the planning will ensure that there is not an excess of plants or design elements purchased. When you call, be sure to give an estimate budget and the square footage you’d like to work with. With these three tips in mind, you’ll be able to start envisioning the perfect landscape design for your yard. Once you have the basic idea, call a professional landscaper and say what you would like.